On the western end of India is the majestic city Jaisalmer. Made of Jurassic sandstone, it is also known as the gold city. Built in 1156 by Raja Jaisal the fort is the last major stop before the India Pakistan border. There is also an Air-force base nearby. The places worth visiting are the king's palace, magnificent Jain temples with intricate designs, a beautiful lake called Gadsisar Lake and many Havelies. The best time to visit this place is in the winters. This also means one needs to get the reservations done in advance to get cheaper accommodation. December to February end are the peak seasons. The prices are high as most of the tourists are foreigners. The fort is also home to nearly 4000 people and is a “living Fort”. Getting around the fort is not very difficult. Auto-rickshaws are available at every corner though they wouldn't be able to take you to every nook and corner of the fort! Another option is to hire motorcycles/scooters. Needless to say,the best way is to see the fort on foot. The fort is quite big and seeing it in one go in a single day requires quite a lot of stamina. Seeing the place over two days is easier and you can also see many aspects of the fort which would otherwise be missed. The fort has many vantage points from where people can see the city but the most popular ones are the sunrise and the sunset points. Both have breath taking views. 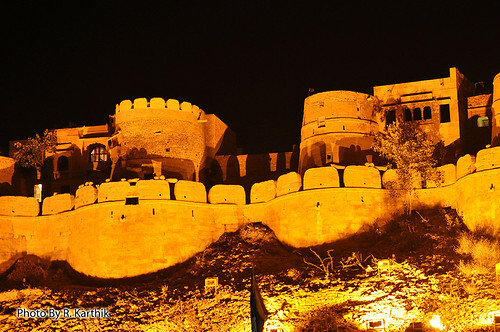 At night, shimmering in golden colour, the fort looks both majestic and imposing. Another attraction, not to be missed, is the different types of cuisines one can sample. Not only can you get authentic Rajasthani food but also Lebanese, Mediterranean, Italian and many other culinary delights catering to the global palate . There is also ample opportunity for those wanting to pickup some local artwork. It's a good place to test your bargaining skills. A view of the Kings Palace. Inside the fortress, are Jain temples dedicated to Jain Tirthankaras, Rishabdevji and Sambhavnathji . Built between 12th and 15th century, it is a fine display of craftsmanship on stone. 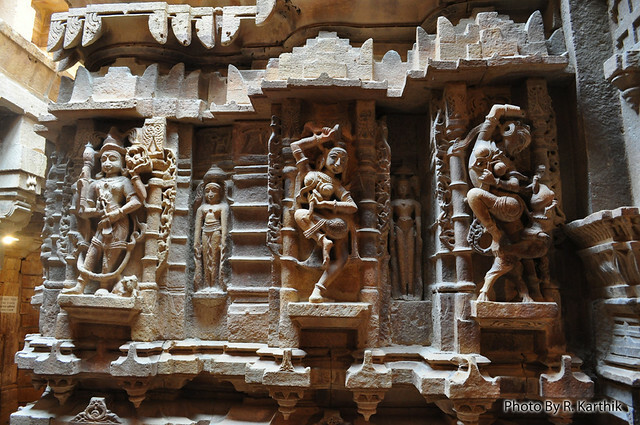 There are three museums in the city - Jaisalmer Folklore Museum, Desert Cultural Center and Museum and Government Museum. The collection may not be very big but it is worth a visit. About 60 Km from Jaisalmer are the Sam (pronounced 'sum') sand dunes. It's a great place to see the sun set and is thronged by many people in the evening. Viewing the desert during sunrise also has its own charm. 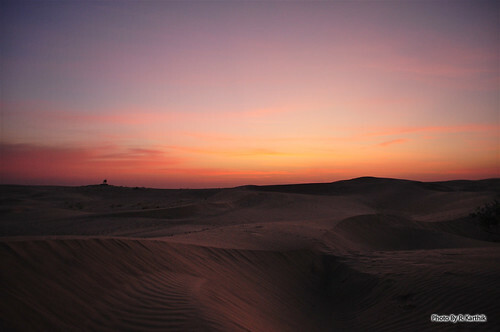 En-route to Sam Sand dunes is the Desert national park. Covering an area of 3162 km²,it is one of the largest national parks in India. It was created to protect the desert ecosystem. The National park has many indigenous species and is home to migratory birds in winter. 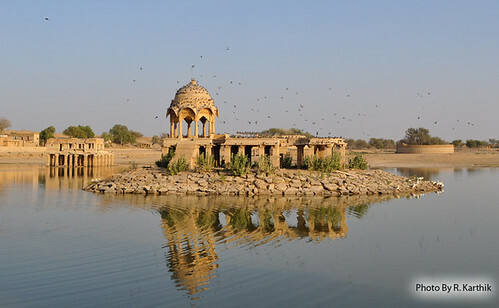 Some 17 Km from Jaisalmer, is another attraction which has far fewer visitors. It is the wood fossil park. Akal wood fossils park is spread over 21 hectares. It has fossil wood which is about 180 million years old. It is a treat for paleontologist and geologist enthusiasts. Jaisalmer is a city which has something for every one. The spectacular architecture, bustling markets, pristine desert beauty and, of course, plenty of history.